MUMBAI, India (CNN) -- As the boy, 13, looks up from his Mumbai hospital bed, his adult brother rests his hand on the boy's forehead, almost shielding him from the pain he does not yet know -- much of his family was killed in Wednesday's terrorist attacks. 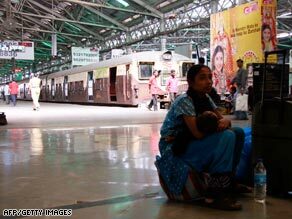 Gunmen entered the Victoria Terminus train station Wednesday and opened fire. The well-planned but indiscriminate attacks targeted two luxury hotels, a Jewish center and the Victoria Terminus train station, where the boy's parents, uncle and three cousins waited to board. The terrorists burst in, firing automatic weapons and hurling grenades, leaving the boy's six family members among the 179 killed across the city. The 13-year-old is not alone in tragedy. A 2-year-old boy became an orphan on his birthday Saturday, after his mother and father, who was a rabbi at the Jewish center, were gunned down. But at the JJ Hospital in Mumbai, the 13-year-old has questions for his brother and his doctors -- where is the rest of his family? Why haven't his parents visited? His brother won't tell him yet. "I feel that if we tell him, he is so young he will be terribly affected by it. He is badly injured now and there might be problems," the brother told CNN. "That's why we thought it's best not to tell him. He's just a kid." Dr. BM Subnis, dean of the hospital, said the boy will have to learn the truth soon. "We have told him that we are locating your parents and they shall soon come back and meet you," Subnis said. "But the way I see him over the days now, the child is very smart and intelligent and has understood that his parents are no more. Everybody is hiding from him that they are no more." Subnis said they feared telling the boy would send him into shock and impact his recovery from shrapnel wounds. "That's what we earlier thought," Subnis said. "But now, this hiding is affecting his recovery." So when the time is right, the brother will share the devastating news. "Once he's out of the hospital, I'll take him to the place where our parents are buried and tell him this is your mother and this is your father and this is the rest of your family and whatever has happened has happened," the brother said.